Jeevaniyam is the journey into a new enriched nourished healthy life. At Jeevaniyam Ayurveda Hospital & Research Centre our mission is to achieve in what we believe by steering you confidently through the paths leading you to a wholesome and healthy life. 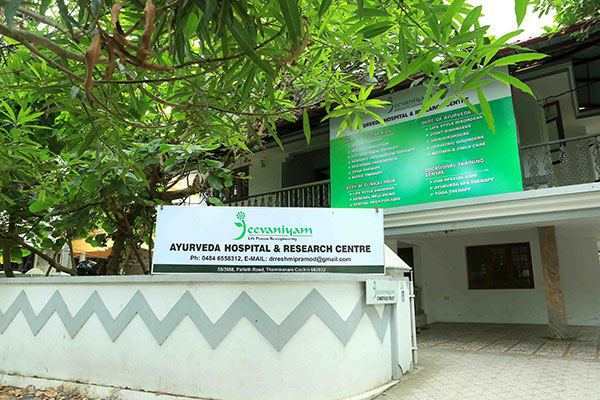 We work towards the accomplishment of our mission through our qualified, dedicated and experienced team of experts from varying disciplines assisting you in your quest for a natural Ayurveda way of living and providing you natural Ayurveda solutions for chronic ailments plaguing and crippling your life. Jeevaniyam Ayurveda Hospital & Research Centre is envisioned with a mission to provide the best health care by adopting a holistic healthcare approach for better living. Our competent healthcare team is complete with proficient professionals in medicine, research, technology, Yoga and spirituality coming together under one roof to design Prakruthi based individualistic programs to meet your specific needs. Our knowledge acquired through relevant qualification, our expertise gained through years of experience in Ayurveda, Yoga, Naturopathy and other related disciplines aid you in attaining a state of optimum health physically, mentally and spiritually. Paving your path to complete holistic health with the wisdom of ancient Indian healing sciences, we lead you through the higher levels of self-awareness by consecutively caring and nurturing your physical form to build a healthy smooth physiological well-being which guarantees you a calm stress free mental status which in turn sharpens your intellectual acumen and finally culminates in you realising your inner self and enjoying the calm serene bliss of cosmic silence. Thus we turn around the psycho-somatic involvement of your illness into psycho-somatic wellness at Jeevaniyam Ayurveda Hospital & Research Centre. Our health care services are multi-dimensional with holistic Ayurveda-Yoga integrated treatment programs; specialized research oriented Jeevaniyam Autism and Learning Disorders Treatment; certified affiliated diploma training courses in Ayurveda and Yoga; social service schemes in association with NULM and operation of Ayurveda-Yoga wellness centres in premier hospitality segment of resorts and star hotels.